It looks like it’s that time again. Time to open the ol’ proverbial can-of-worms. Few car audio topics on the internet get as much back and forth and outright bad information as the answer to this question. Do a quick Google search on breaking in subwoofers and you’ll get a load of comments on car audio forums with answers ranging from technical explanations and numbers to outright ridiculous anecdotes of people’s subwoofer break-in stories. So do they need break-in or not? One of my personal favorites is the suggestion of plugging your subwoofer into a standard AC wall outlet to generate a 60Hz tone. PLEASE DON’T do this. You will get 60Hz… and you’ll get to watch your voice coil melt in real time. Plus you’ll have the wonderful experience of explaining to the rest of your household why that smell of burnt rubber and metal won’t go away. Many people claim that you should run your sub at half power for x amount of time before it is safe to put full power to it. So why do people insist on subwoofer’s needing a break in period? 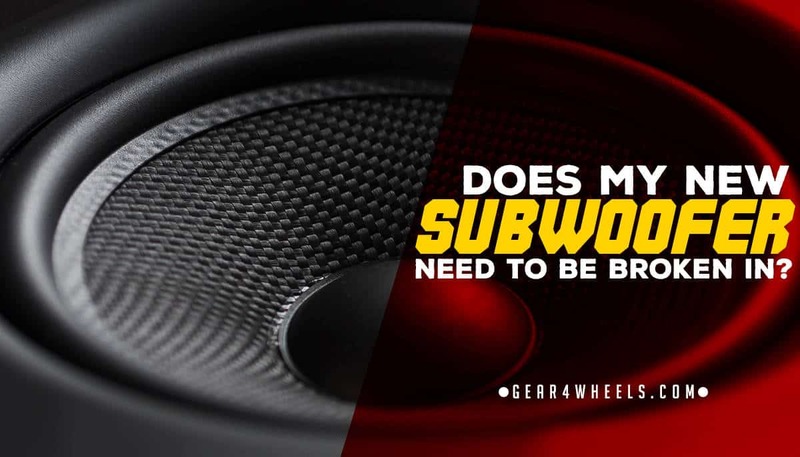 The most common explanation is that a new subwoofer has a stiffer rubber surrounds that gradually loosens up over time. The other common explanation is that, as well as the surround, the spider needs to loosen up as well. While it is true that the rubber surround will loosen up over time, in most cases it is not necessary to play your subs at a lower wattage or volume right out of the box. Yes, your surround will loosen up and it will tend to play lower and louder due to the gained travel or “xmax” of the surround once it has loosened up but this is typical of all subs and it will happen regardless of power or volume. Related: Ported Vs Sealed. ﻿Ending﻿ the basshead dilemma. There are a few exceptions (as always) to rules. Cold weather: If you live in a climate where it is below 40 degrees or so on a regular basis, you probably should take it easy on your subs at first, however this applies not just to new subs but EVERY time it is cold regardless of the age of your sub. The reason should be obvious but since common sense is not everybody’s forte I’ll explain… When a solid, liquid or gas is heated it expands and when it is cooled it contracts in accordance with the First Law of Thermodynamics. A lot of objects when cooled to a certain temperature become more brittle, such as the rubber surround on your subwoofer. If stressed too much without proper time to warm up, it could damage or tear the rubber. When purposely overpowering your subs: Some subwoofers can safely be powered at well over their RMS rating. Lots of manufacturers purposely put a conservative RMS rating on their subs. There are reasons for this but we will not cover them here. It is always a good idea to run a new sub at the RMS rating for a bit before running it at or near max rating. NOTE – It is always recommended to match amp and speakers using the RMS rating and NOT the MAX rating. A lot of low end products are advertised at their MAX rating instead of the RMS. These products typically would not last very long nor are they made to be powered anywhere near their MAX. For amps that are advertised with MAX ratings, they are typically not going to put out anywhere near that much power. A good example of that is BOSS, Pyle and even some Pioneer amps. The Pioneer GM-6704 for instance, is advertised as a 1000 watt amp however the true RMS rating is 60 watts. That’s a big difference and something to be aware of when shopping for amps and matching amps to speakers or subs. Always try to buy a product that puts out or can receive as much power as it advertises. Lower end products: There are some manufacturers that recommend a break in period. These typically are the budget subwoofer manufacturers. I know, I know, you have x subwoofer from x manufacturer and it sounds awesome. I don’t doubt your subjective experience, but these are the facts. Recommended: Mixing subwoofer sizes. Good or bad idea? Now I’m sure that there are probably readers out there who either don’t believe me or think I’m wrong for whatever reason. While I, like all other humans, am a fallible individual, I have done my research and generally like to have a pretty good idea of what I’m talking about before I open my big fat mouth. Sundown Audio: “Our subwoofers do not require any special break in procedure. It is a good idea to play subs at less than max volume for a few days to let the surrounds loosen up, but they are perfectly safe to play using RMS wattage specs.” – Sundown Support Rep.
Alpine: “There is no recommended break in procedure for our subwoofers. As long as they are being powered at RMS wattage, you can run them normally. The surround may take a few weeks to a month before being fully loosened up and specifications are stabilized, depending on your listening habits.” Alpine Support Rep. I decided to include one more link (for the haters) from a budget SPL sub manufacturer that DOES recommend a special break in procedure. Since they are quite popular with budget bassheads, I am going to state that they most likely give this information out to reduce warranty claims and repair costs. So there you have it folks. A quality subwoofer should not require any special break in procedure other than common sense i.e. not overpowering your subwoofer, not cranking the volume right away when it’s cold out, or unless the manufacturer specifically states that your model of sub that it does. Happy bumping!